Alter Egos in a Virtual World As the old New Yorker cartoon said, "On the Internet, nobody knows you're a dog." And if you're an online gamer, your opponents may not know that you're a 27-year-old white mother pretending to be a large, black male warrior. 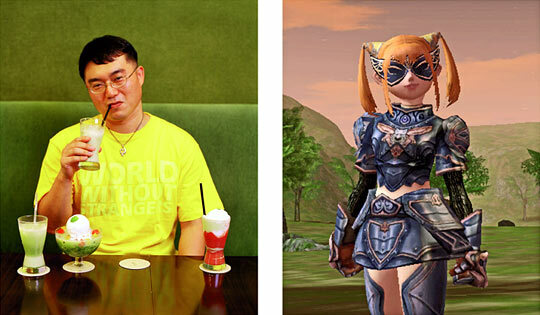 Choi Seang Rak (left), an economics and public policy professor at Dongguk University in Seoul, South Korea, and his Lineage II avatar, Uroo Ahs. "Because I'm very polite, people think I really am a little girl," he says. Time was that the word "avatar" meant the earthly manifestation of a god. You might have also used it to describe an archetype. But in the earliest days of the Internet — back in the 1980s, when no one was looking — an avatar became one's digital self. If this is news to you, consider yourself extravagantly late to the costume party that is online role-playing. Let's get you up to speed. Introducing 27-year-old wife and mother Becky Glasure, who complains of never being taken seriously. "Maybe I just exude it, I don't know. But I feel like I'm this short person with this squeaky little Filipino voice and nobody wants to pay attention." Glasure's first online game was Everquest and her avatar was female. But all anyone noticed were her pixel breasts, and this despite her considerable gaming expertise. Fed up, she switched digital identities. "And I picked the biggest, blackest guy I could find," she says. She called him Stygion Physic — Stygion from the River Styx, Physic for healing. That's the closest she could get to "Bad Medicine" in the game, City of Heroes. And with her change of avatar, her pleasure in the game changed. "When I play this big guy, everybody listens to me," she says. "Nobody argues with me. If there's a group of people standing around, I say, 'OK, everybody follow me!' And they do. No questions asked." Though it's hard not to wonder what her choice of avatar says about Glasure. Cue the cyberanalysts and virtual ethnographers, including Tracy Spaight, who's been inquiring into human gaming behavior for as long as there have been online games. "A sociologist at MIT, Sherry Turkle, described these environments as laboratories for the construction of identity, says Spaight. "In the virtual world you can be anything you want to be ... construct a persona that is wildly different from your real world self." Spaight's own fascination with role-playing, avatars and gaming has been realized in the book and traveling exhibit Alter Ego: Avatars and Their Creators. It's a collaboration between Spaight and portrait photographer Robbie Cooper, who has avoided the temptation of massively multi-player online role playing games (MMORPGs, or simply MMO's). "I played one of these games for two days once," Cooper says. "Scared the hell out of me. I made the decision never to play one again. Because? I would end up just vanishing into it!" Cooper and Spaight traveled to China, Japan, South Korea, parts of Europe and the United States to photograph and interview gamers, whittling down some 3,000 applicants to the several dozen people featured in their book. There is ample repetition, even among them. 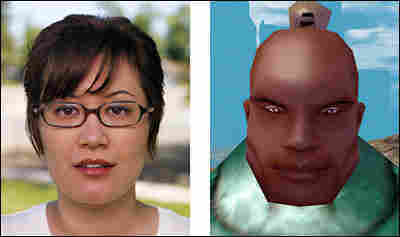 For one, quite a number of avatars are just younger, thinner and prettier versions of their creators. For another, just as many avatars are polar opposites of their people. Cooper's portrait of Jason Rowe, for instance, stops you dead. He stares straight at you out of startled blue eyes. 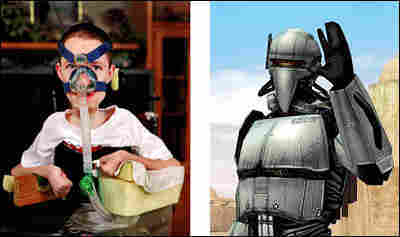 But what takes you aback is his frail body, his clenched hands, and the ominous ventilator strapped to his face. "My condition is called Duchenne Muscular Dystrophy," Rowe told Spaight. "It pretty much affects all the muscles in the body. They don't function." Rowe does have a little movement in his thumbs, which enables him to play the MMO Star Wars Galaxies an average of 80 hours a week. His avatar is a steely, robot-like character who rides Imperial speeder bikes and fights monsters, his head helmeted, his face unseen. "My character in the game is a lot different from what you see here in real life," Rowe says. "[It] pretty much gave me a window to the world." In the four years since he created his avatar, this frail 32-year-old has had an unprecedented life experience: Online, he is treated as an equal among his peers. "Not disabled," he says. "Not in a wheelchair. In virtual worlds, everyone is on common ground." Game designer Celia Pearce, an assistant professor at Georgia Tech, is no stranger to the transformative experiences people often have through their avatars. "For instance, I have a very close friend who's in her mid-40s who started playing Everquest," Pearce says. "She's kind of shy and extremely conscious of pleasing other people. When she came into the game, she took the character of a necromancer." In the game, a necromancer is the master commander of the dead. "She began to become much bolder, stronger and more assertive as a result of playing this character," Pearce adds. "And she was able to carry that over into her real-life interactions." Pearce's friend didn't set out to overcome shyness; Rowe didn't set out to overcome people's prejudice. And Glasure, whose male avatar became a leader, doesn't mean to lose patience when friends and family don't fall in line. But stay in costume long enough — whether a general in a Civil War re-enactment, or a wench at a Renaissance fair — and the lines may blur between who you are and who you're pretending to be.